HOW MANY PIGS HAVE YOU SLAPPED TODAY? 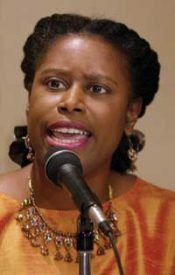 A U.S. Capitol Police officer is considering filing assault charges against Rep. Cynthia McKinney (D-Ga.) after an altercation in which she allegedly hit him after he asked to see identification, according to a source familiar with the incident. The incident occurred at approximately 8:50 this morning at the New Jersey Avenue and C Street entrance to the Longworth Building. As McKinney was entering the building, the officer stopped her and asked her for her ID. McKinney allegedly hit him before identifying herself as a member of Congress and walking away, the source said. The lawmaker's office would not comment on the incident. Sgt. Kimberly Schneider, spokeswoman for the Capitol Police, was unable to confirm the details of the account. "The matter has been brought to our attention and is currently under investigation," she said. Jackie Kucinich contributed to this report.